Christmas day, temperature -16C, skies blue and bright with winter sunshine and a light covering of new snow on the ground. 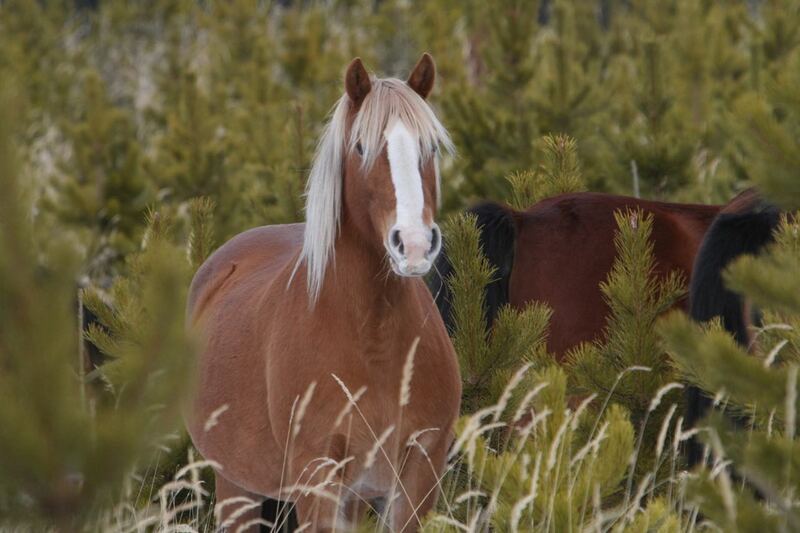 What is a person to do, but go visit our wonderful wild horses and so off we went. Anyways with some of the negative happenings out there recently we like to keep an eye on what is going on out there. Travelling west into the forestry you could quickly tell with the little bit of fresh snow, how recently the horses had been around. 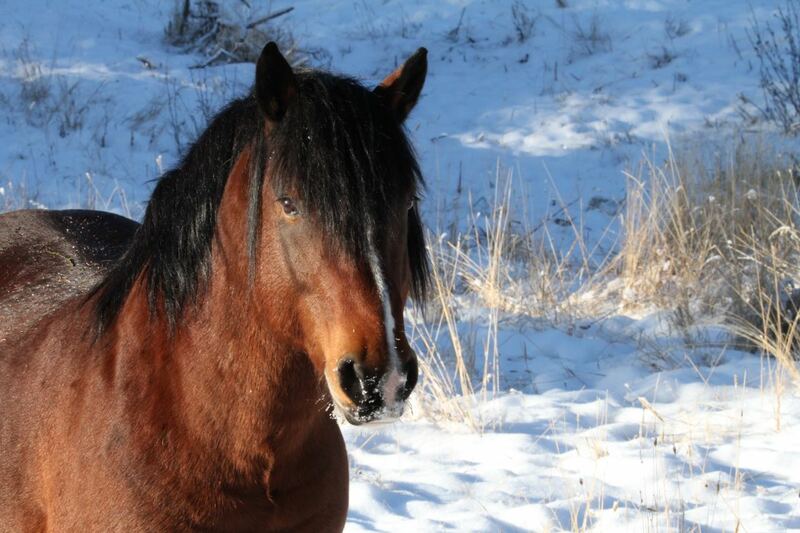 With the cold temperatures the horses we began to find were out in the sunshine, pawing their way down to the grass. Then too there were some that just wanted to relax and feel what warmth the sun had. 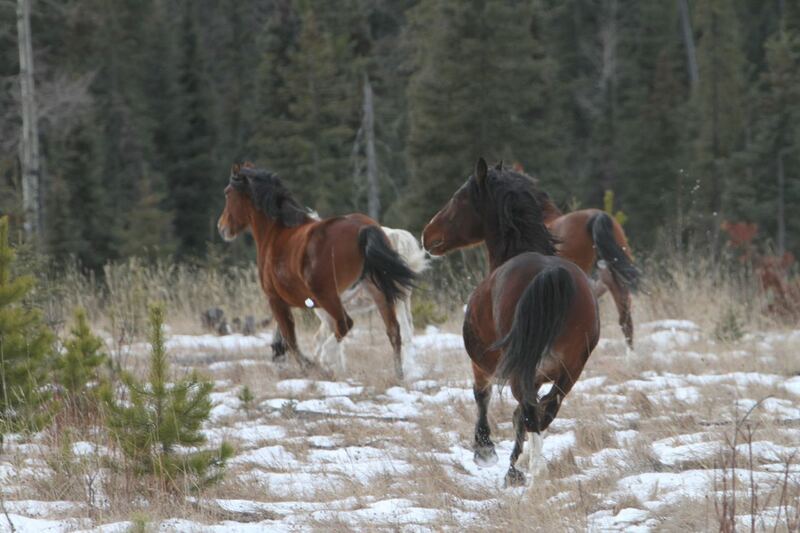 This year with the small amount of snow, (4-8″) in almost all of their range, the horses are having an easier time of it. It also allows them to move about more extensively to find forage, probably even more than they do in the summer months. Compared to a couple of winters ago, confined by the deep snow, you would find the herds on every trip, in the same areas. This also makes it easier on us to travel the backroads to check up on the horses. 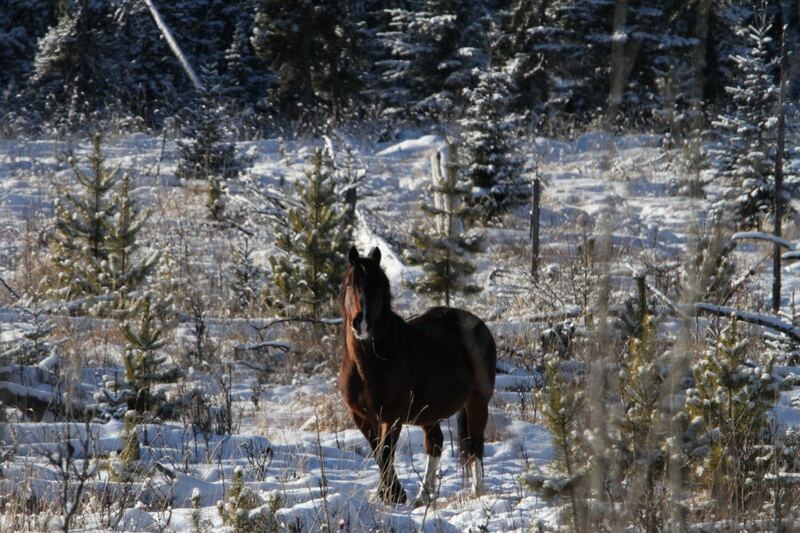 Travelling down a seldom used trail we came across this impressive stallion who had his herd out in an open clearcut. Right way he moved toward us to snort out his warning. 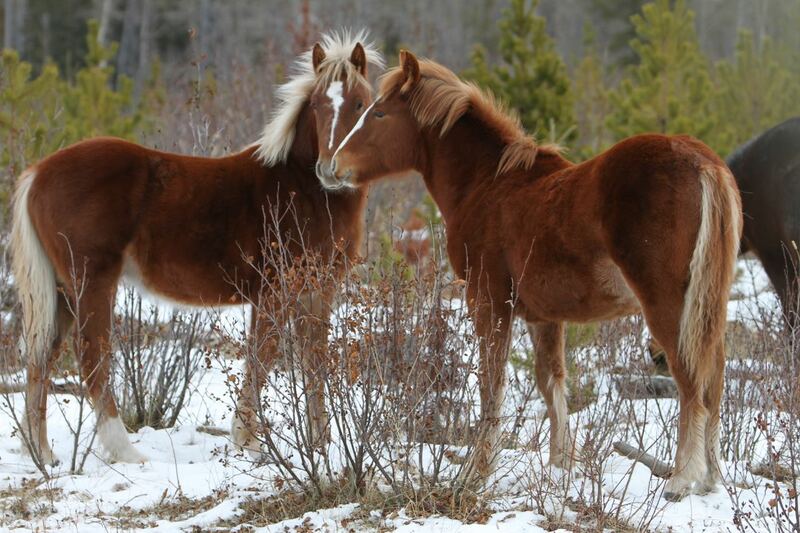 He had two mares, both bays and a unique coloured filly with him. 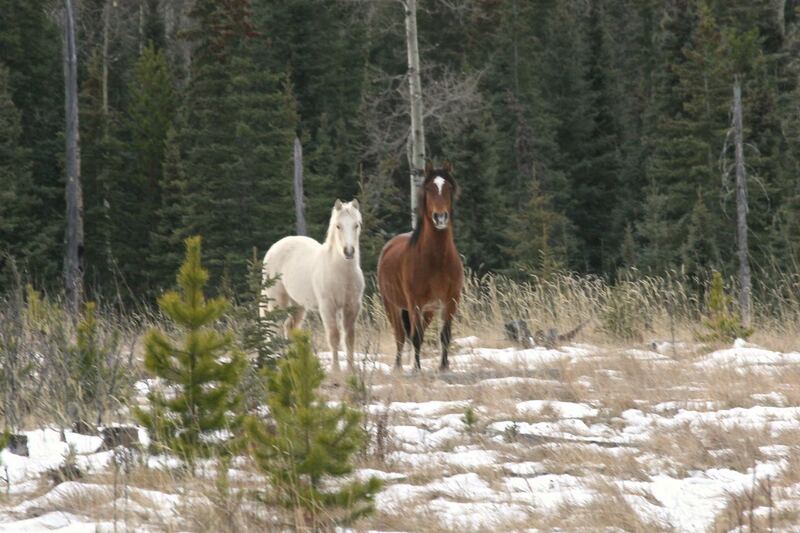 Standing beside her mare, we marvelled at her Palamino colouring and where the genes that caused it originated from. Having had enough of these strangers the herd decided it was time to leave, with the stallion taking up the rear, being protector of herd. 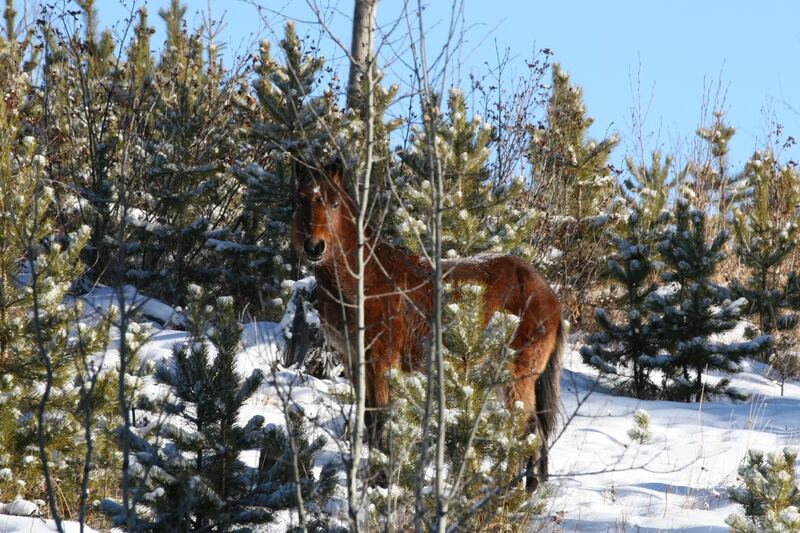 Being such a beautiful day we put on many kilometres checking several areas where we know the horses like to winter. 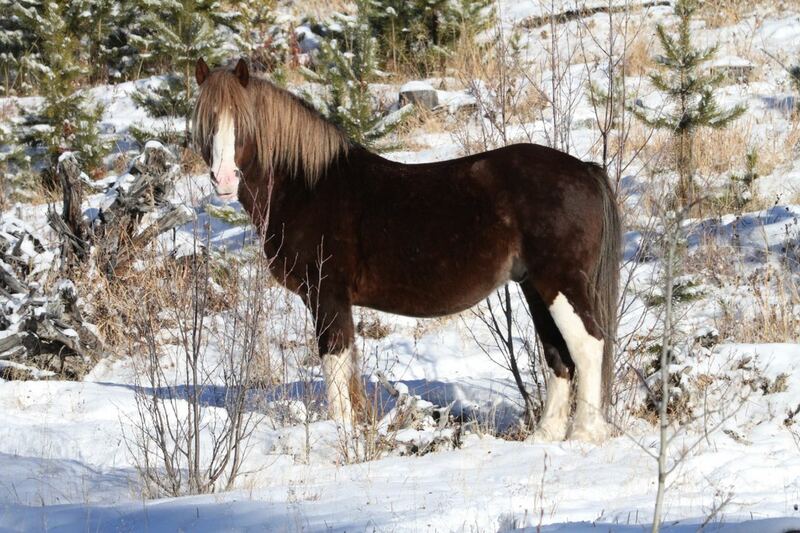 Rounding a bend on a trail we came across our most favourite stallion who many years ago we had named “Socks”. He was first seen as a yearling in 2003. At that time he impressed us so much as when his sire came out to challenge us and along came the little boy to help his dad. It was amusing to watch as his father stomped his foot in warning, Socks mimicked him stomping his little hoof too! In 2007 he was our calendar cover boy. 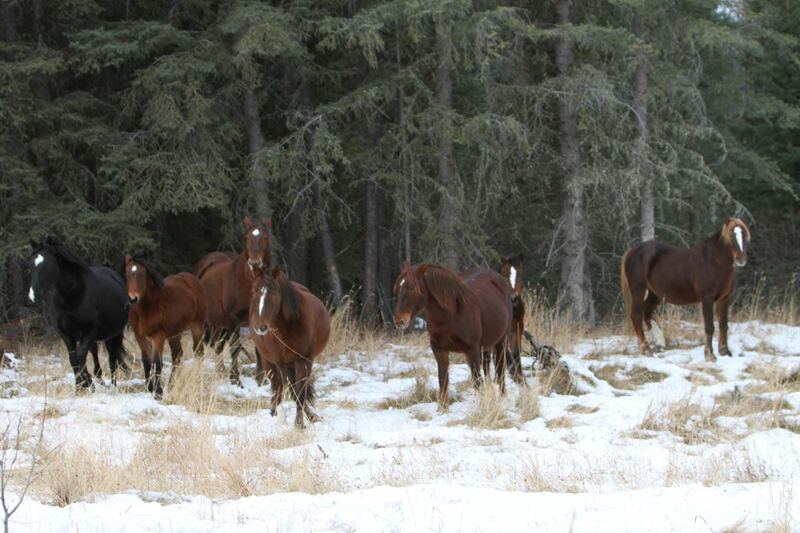 At one point in his prime, he had a herd of 13 mares and foals. 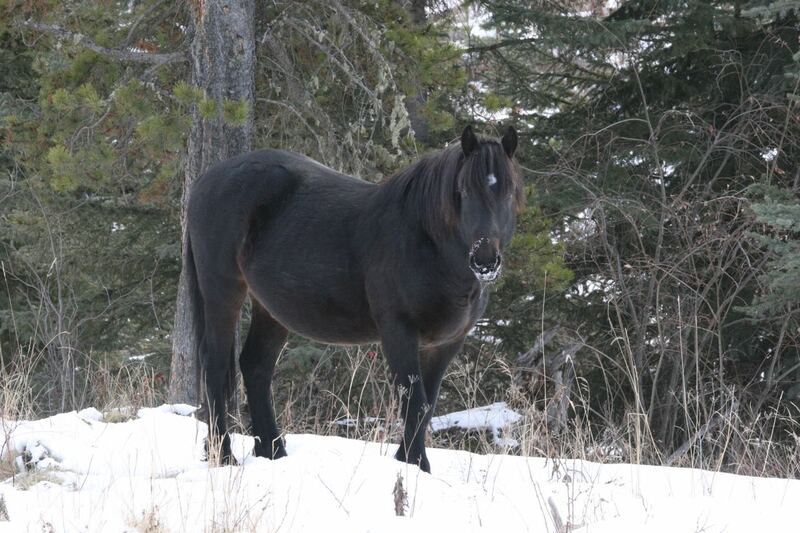 Then in 2012 we came across him where he had lost the fight to a much stronger, younger stallion and had lost his herd. At that time I feared that he may not survive. The next year though we were so delighted to find him again with two mares and looking so proud. 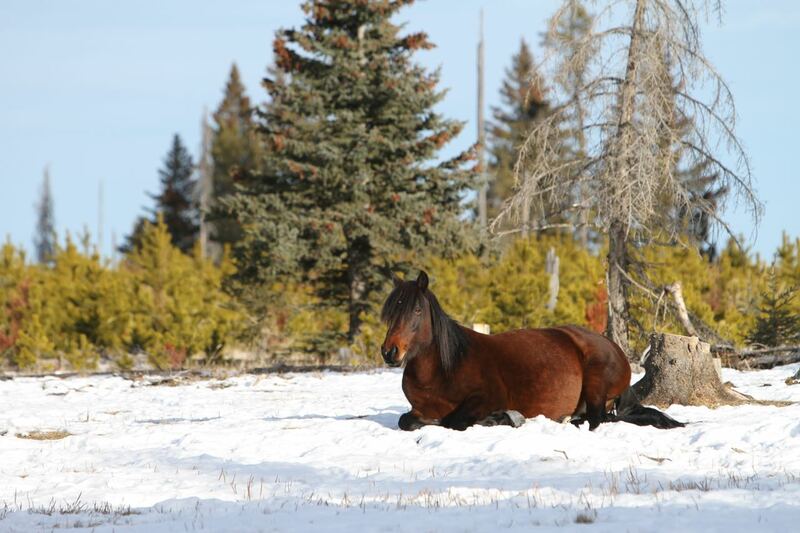 This day when we found his herd, his five mares and two foals were with him enjoying the sunshine. These two are definitely pregnant. This is one of his foals and as with all the young ones we’ve seen so far, they are all in such good body condition and looking so strong. Being one of the shortest days of the year, the sun started to set so early, but we found this beauty with her herd in the last rays of the day. With that we headed home for our Christmas dinner. 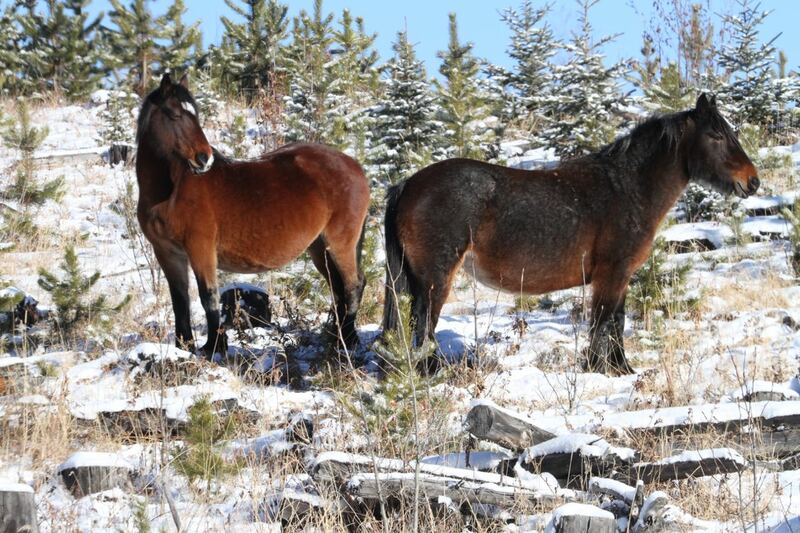 Wishing all the wild horses a Merry Christmas from their supporters. 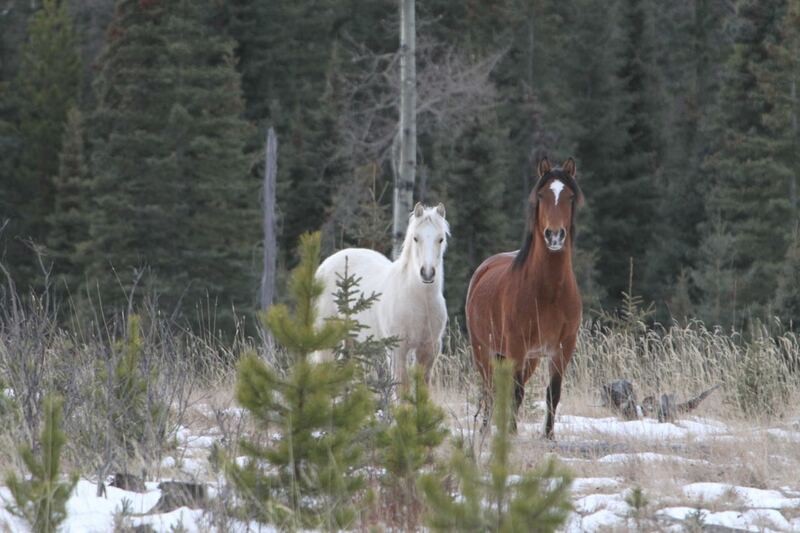 WHOAS appreciates all visitors to the back country who keep an eye on the welfare of these magnificent animals. Auction . . . or Adoption? They are so beautiful!… thanks for sharing with us! They are so gorgeous! Thanks for keeping an eye out for them.